The Girl in Yellow Scholarship is designed to give rural girls in India the opportunity to pursue their education. The scholarships are given to girls who need financial assistance in order to complete their schooling, around 8th grade standard. This will help to avoid the instance of forced marriage, which would likely cost her the opportunity to finish school. The scholarship helps girls who aspire to pursue their education and show the most promise to succeed in school and in life, but would most likely not be able to attend school due to financial challenges or family issues. Each year, leadership from the Self Employed Women’s Association (SEWA) meet with SEWA members from rural communities to discuss the scholarship and elect girls to be considered as recipients. The girls who are selected are then provided with a scholarship to cover tuition, books, testing materials, and transportation, beginning around 8th grade standard, continuing through 12th standard. Girls who show the most promise will then be eligible to receive an additional three years of college tuition and fees, so she may obtain her undergraduate degree. Your support provides girls like these with a life changing education. Support Shaba's education, make a contribution today! Shaba is an inspiring 14-year-old girl who lives in Ahmedabad, in the Indian state of Gujarat. Her father is a rickshaw driver, and her mother is a garment worker, who stitches at home. They work day and night, and barely manage to make ends meet to support Shaba and her two brothers. Her family’s income is less than $120 USD per month, and a sizeable portion of their income is necessary to rent both the rickshaw and the sewing machine each month. Shaba is currently a 10th grader, and loves going to school. Her favorite subjects are English and Social Studies, and she is also interested in computers, which she sometimes gets to use in her school. She wants to become a teacher and motivate girls like her to pursue their studies. Shaba is so committed about her studies that she says she does not mind walking for half an hour to reach her school, even though the city can reach up to 109° Fahrenheit. Her family cannot afford extra tutoring classes for her or even help her with her homework, but she manages on her own and receives good grades. During her exams last year, Shaba got Dengue fever, and still managed to do well. Her mother says that they cannot afford the costs of Shaba’s education, and they often borrow money from the money lender to cover her education costs. Her mother is passionate about seeing Shaba continue her education and achieve her dream of becoming a teacher. Support Alfina's education, make a contribution today! Support Diwan's education, make a contribution today! 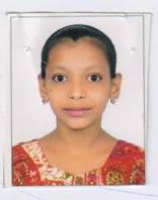 Diwan is a bubbly 14 year old girl who enjoys reading, listening to music and playing Kabaddi. She is a star player and the leader of her school team, recently winning the statewide Kabaddi championship. She is also an excellent student with high grades who hopes to become a teacher. 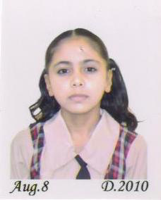 She is currently in the 8th Standard at the Model English School in Ahmedabad. After her father died 9 years ago, Diwan’s mother, Zahedabanu, was left to support her and her two brothers alone. Zahedabanu moved the family to Ahmedabad in an effort to find work; she now sews clothes in her home. Despite long hours, she is only able to earn about 1500 INR a month. This is not nearly enough to pay basic living expenses and school fees for her three children. SEWA, an all-women’s labor union in Ahmedabad, has funded Diwan’s school costs for the past two years. 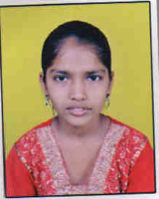 This year she will be funded by SEWA’s partner, the Girl in Yellow Foundation. This funding is an important step in making Diwan’s dream to finish her education and become a teacher possible. She has taken full advantage of being able to continue her schooling. Support Mahanur's education, make a contribution today! Mahanur is 13 years old and lives with her father, a vegetable vendor, her mother, a readymade garment worker, and her three sisters at a house given to them by their Mosque. Her father and mother work very hard but can barely make a living; some days they don’t have enough to feed their family. Her eldest sister received her school tuition from generous neighbors. Mahanur wants to study as well but doesn’t want to burden her family with the additional expenses. With the help of the Girl in Yellow Foundation’s scholarship she gets to further her education without any cost to her family. Support Priyanka's education, make a contribution today! 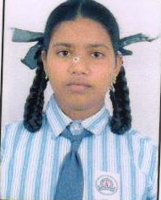 Priyanka is 14 years old and is in the 9th standard. She lives with her brother, her mom, and her grandfather in a one room house in Isanpur. Her father left many years ago so they rely on her mother’s salary of Rs. 100 per day doing stitching work. Priyanka is fond of studying and likes math especially. She is very interested in computers and studies them in school. She wants to become an engineer when she grows up and take up a good job and look after her mother. 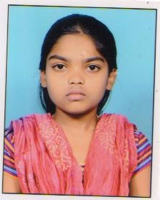 This scholarship will help Priyanka to achieve her dream and will alleviate some of the financial pressure from her mom, who currently pays for both her son and daughter to go to school.